I don’t know about you, but I have always been an Oatmeal fan. 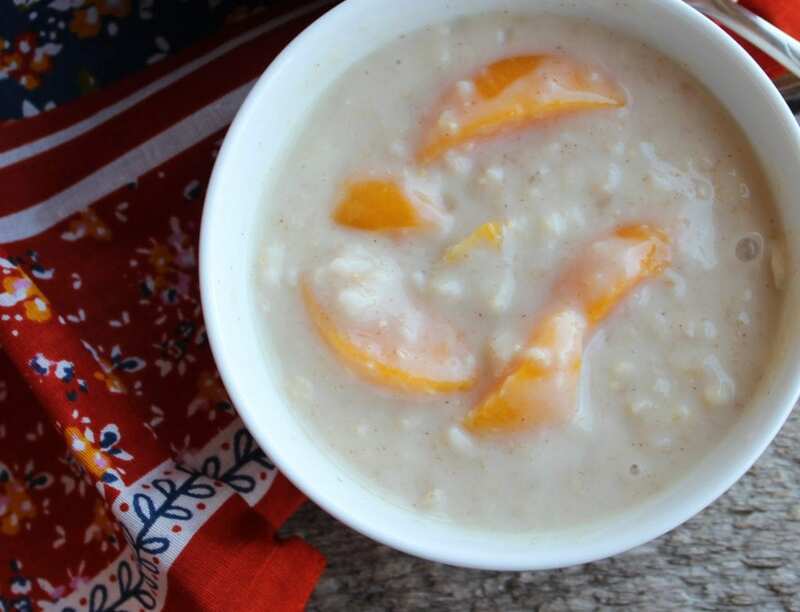 I know oatmeal is one of those things that you either love it or hate it, so I know this recipe won’t resonate with some of you, but to all of my Oatmeal lovers out there, I see ya, and I’m coming for ya with this fabulous Instant Pot Peach Oatmeal recipe! This recipe is ready in only eight minutes from start to finish. 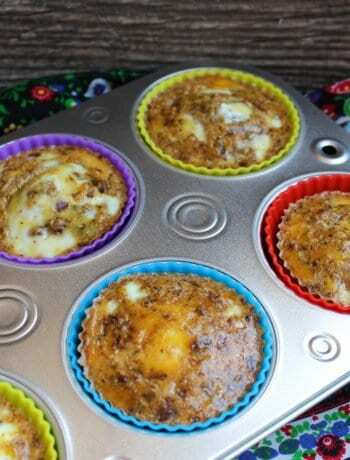 Do you know of any other breakfast recipe that is made that fast? There’s not many! That’s what makes this Instant Pot Oatmeal a perfect breakfast for a busy school morning or Easter Sunday Morning! 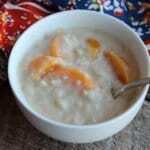 Nothing like a bowl of steaming hot, Peaches and Cream Oatmeal on a cool spring morning! This easy homemade peach oatmeal reminds me of those Quaker Oats packages of instant Peaches N’ Cream oatmeal that I used to eat as a kid. Did you ever eat those? My mom would buy the variety packs and would throw a bowl of it in the microwave every morning while I was getting ready for school. The Peaches N’ Cream Oats and the Maple Cinnamon Sugar were always my favorites. If you’re also a fan of the instant oatmeal packets, let me tell you why you should start making it at home. One reason is because homemade is always better! You get to control what is going into your food – which includes no preservatives, artificial colors or flavors, and…are you ready for this…NO ADDED SUGAR! What?! Yeah! You heard me correctly! This Instant Pot Oatmeal is sweetened with raw, organic, local honey! If you don’t have access to local, unfiltered honey, just purchase raw organic honey from your local market or grocery store, or you can use raw organic maple syrup. Let’s step on over to my kitchen and get started on this oatmeal. 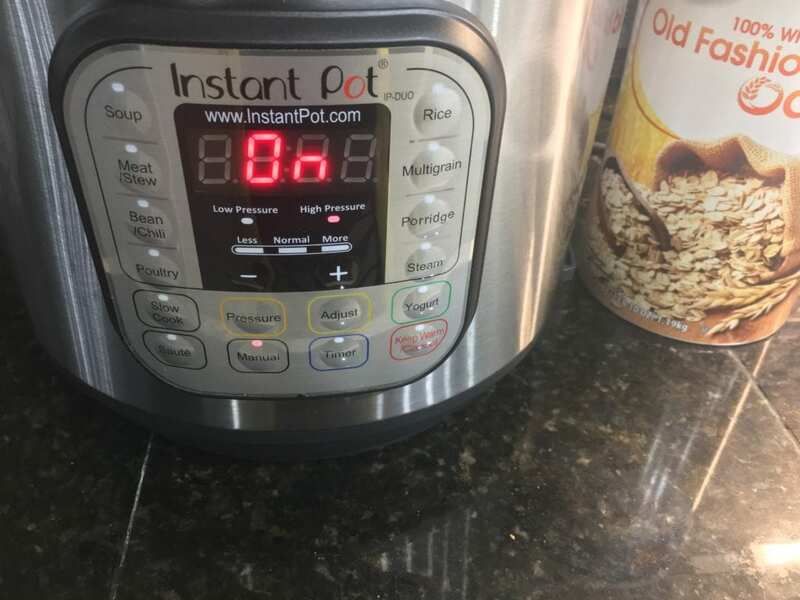 I’m using a six quart Instant Pot DUO electric pressure cooker to cook my oatmeal in. Any electric pressure cooker will work, but I can only give cooking instructions for the one I have since this is the only electric pressure cooker I’ve ever used. You can also make this oatmeal in a pan on the stove top by following the package directions on your oatmeal container. Place two cups of Old Fashioned Rolled Oats or Steel Cut Oats into the Instant Pot. It is important to note that you can NOT use instant oats! These must be the regular kind of oats. 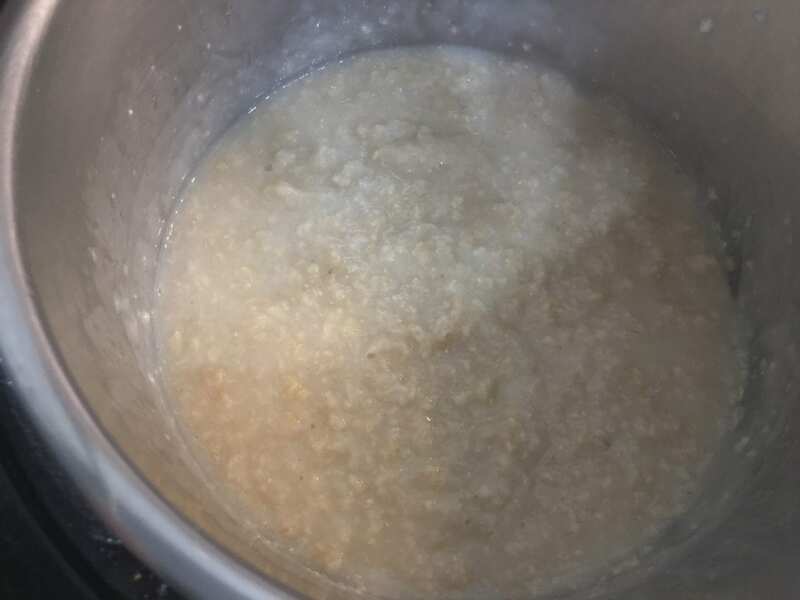 Once the oats are in the Instant Pot, add in six cups of water. This seems like a lot of water but the Instant Pot needs plenty of liquid to to come to pressure. 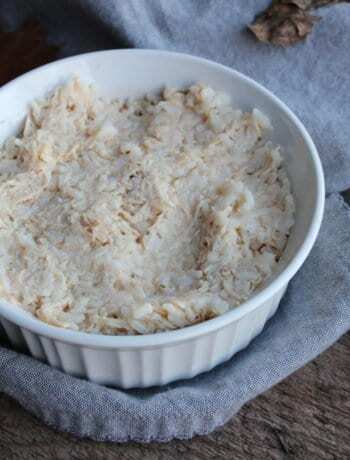 The oats won’t be watery or soggy when they’re finished cooking. Lock the lid onto your electric pressure cooker and set the steam release valve to the sealing position. Now that your lid is locked into place, select the “manual” cooking setting. 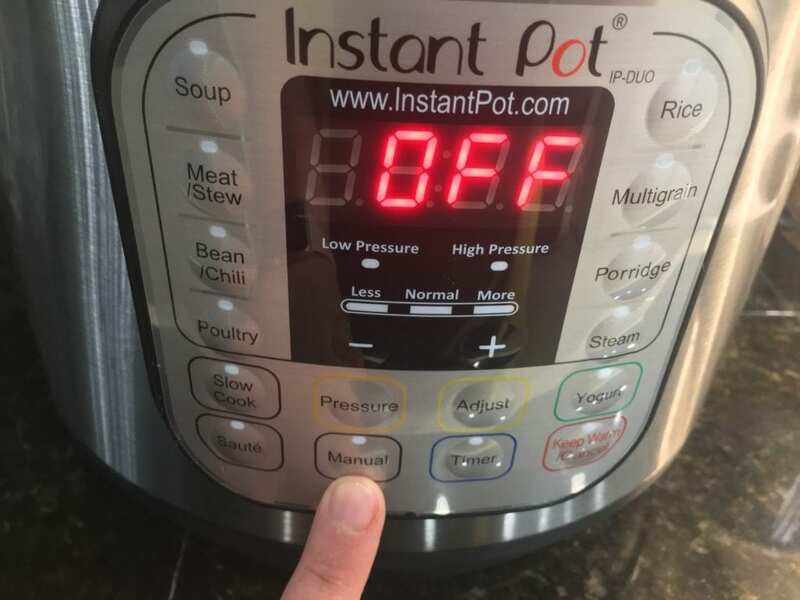 After selecting “manual” make sure your Instant Pot is set to “high pressure”. If it is not set to high pressure, select the plus sign right under the “Less, Normal, More” feature and press the plus sign until your setting switches over to “high pressure”. 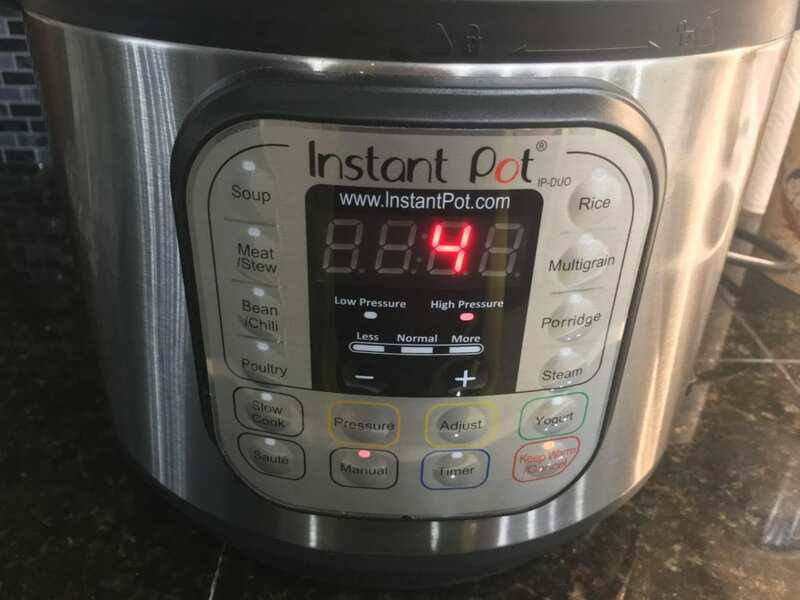 Once your Instant Pot is set to cook on manual, high pressure, adjust the time using the plus and minus signs until you see a number four on the screen. This signifies that your oats will cook for four minutes on high. 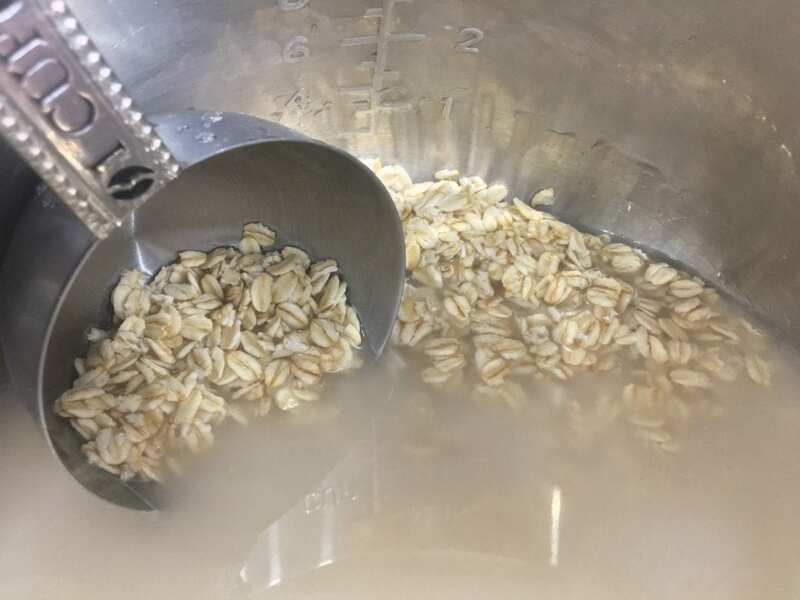 For firmer oats, just cook them for three minutes on high pressure instead of four. 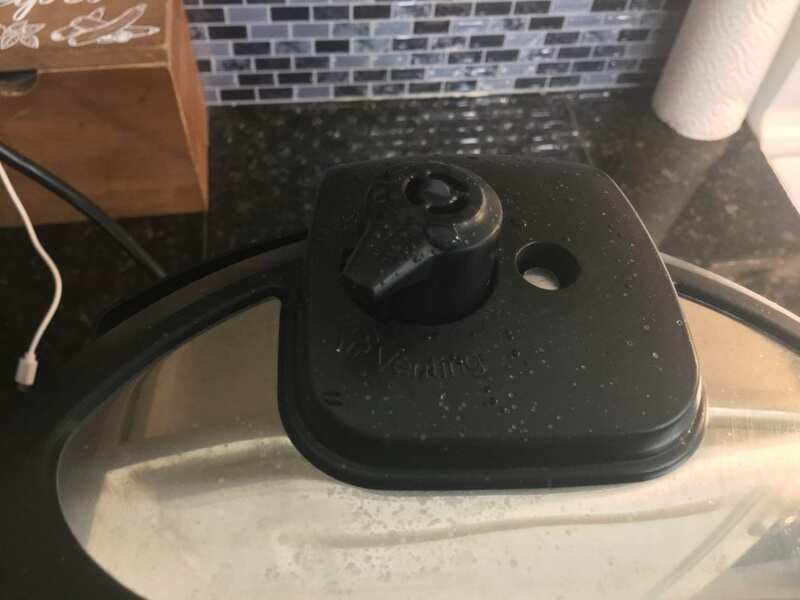 Once your electric pressure cooker enters into the cooking process, you will notice that the silver pressure pin on the top of the lid is up. This means your Instant Pot has came to pressure and is doing it’s thing. Don’t be alarmed if you hear a hissing sound as it comes to pressure. This is some of the steam releasing around the pressure pin and is totally normal! 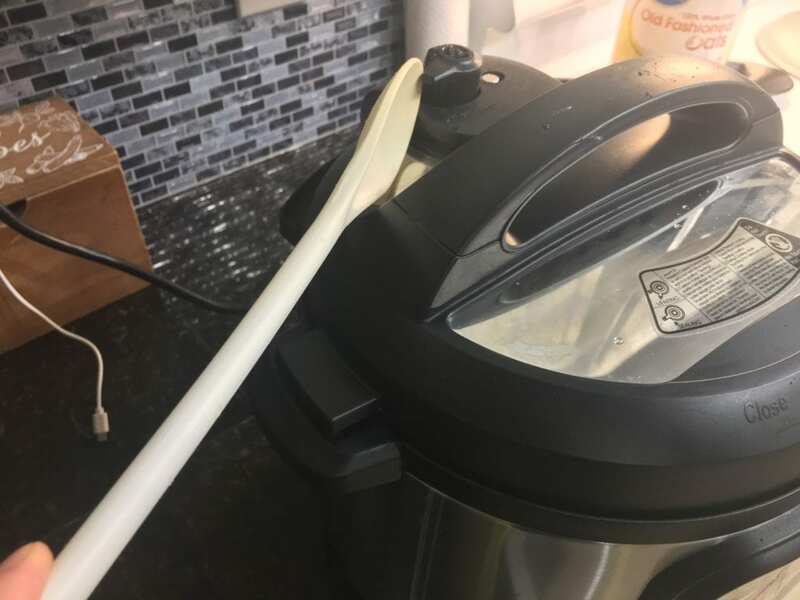 I can assure you, your Instant Pot isn’t about to take flight or blow apart the kitchen. 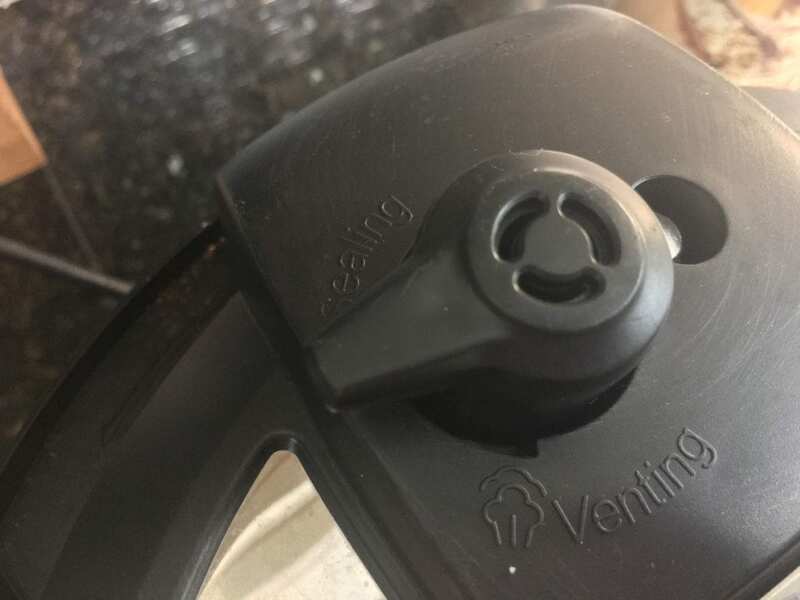 Once your Instant Pot has finished cooking and beeps to let you know the cooking process is complete, go ahead and quick release the pressure by moving the steam release valve from the “sealing” position to the “venting” position. You want to quick release the pressure rather than waiting for it to release naturally. 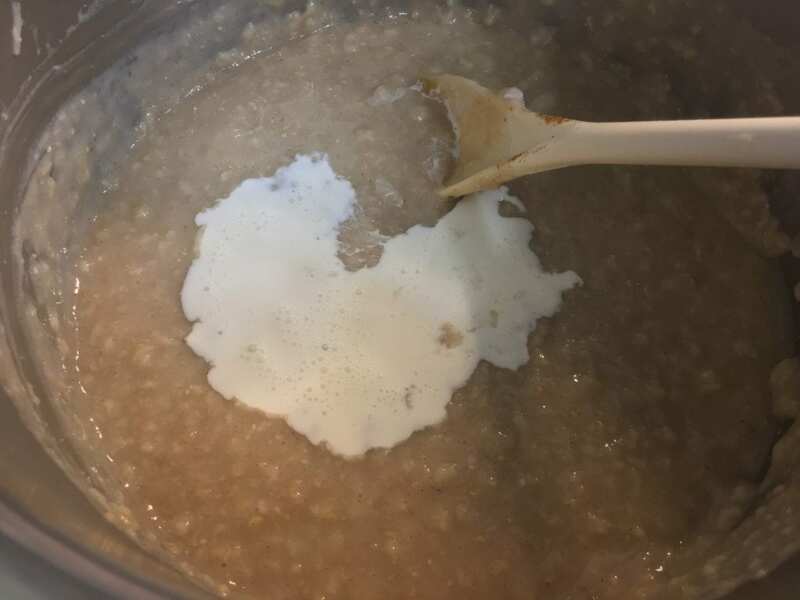 The oatmeal will continue to cook while the pressure releases and this will result in overcooked, mushy oatmeal if you just wait for the pressure to release naturally. I like to quick release the pressure from a short distance using a long spoon or spatula. 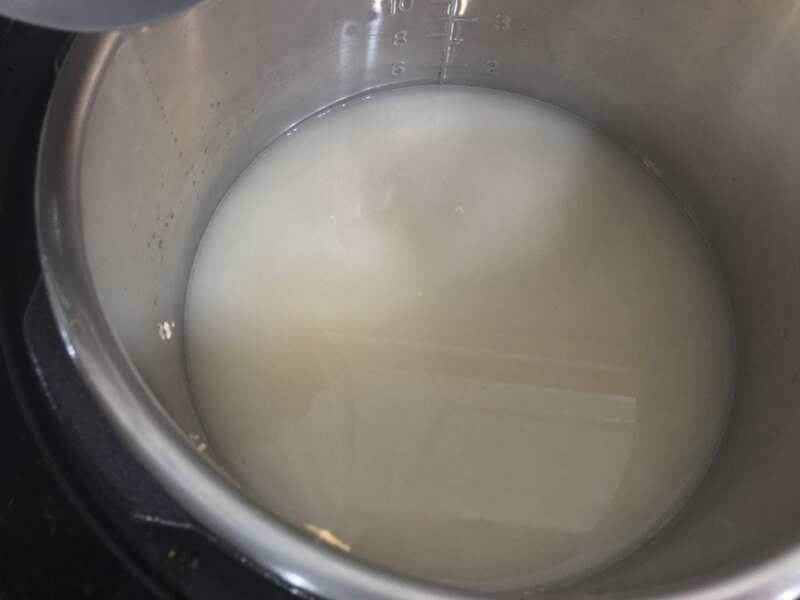 The reason is because the steam is very hot when coming out of the top of the Instant Pot and sometimes, some water will be released from the top with the steam – you don’t want that water and steam ending up spraying on your face or hands! Once the silver pressure pin drops down all the way, you know all of the pressure has been released from the electric pressure cooker. Now it is save to unlock and remove the lid. 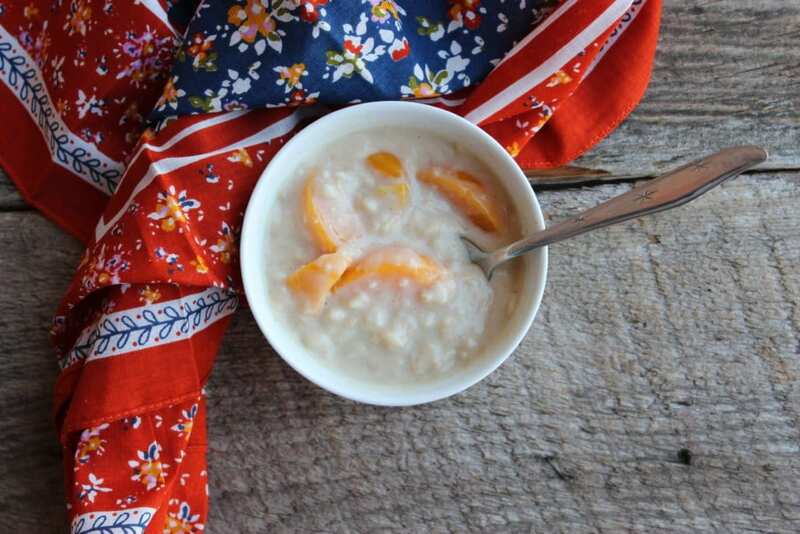 Your Instant Pot Peach Oatmeal is getting closer to being ready to serve and eat! Yum! Give the oats a couple of good stirs and get ready to add in some ingredients to make the oatmeal fabulous. I like to add half of a teaspoon of organic ground cinnamon. You don’t have to use organic ground cinnamon, any ground cinnamon will do. I just love the little hint of cinnamon flavor in this oatmeal! Now add in half of a cup of raw unfiltered local honey or raw organic honey. 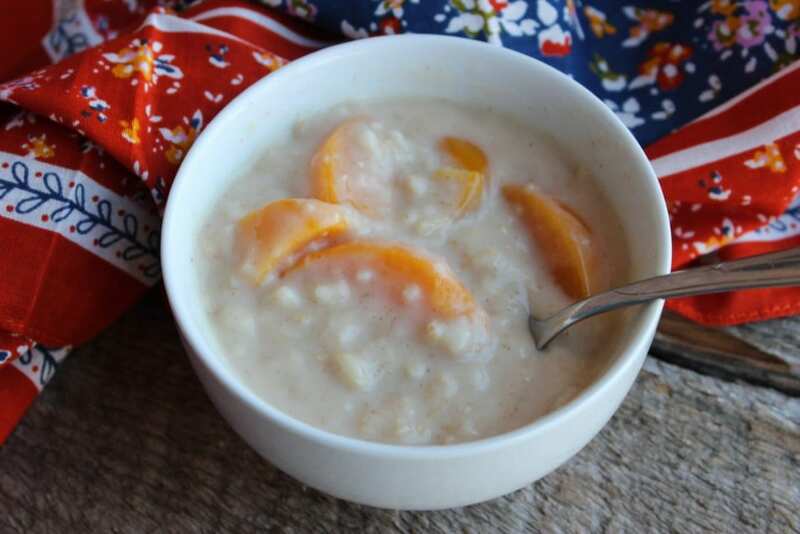 I love to use honey to sweeten my peach oatmeal because it just gives it such a good flavor! 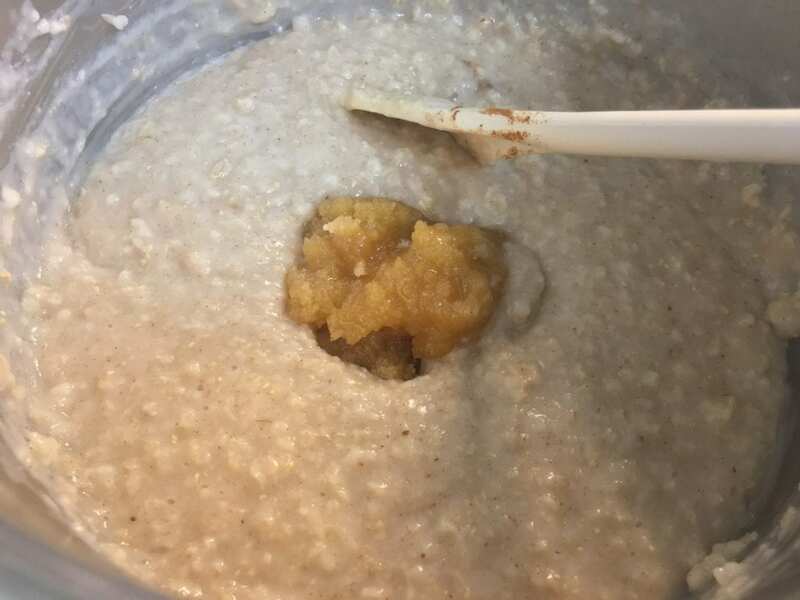 My honey was slightly crystallized but it melted as I stirred it into the hot oatmeal. Honey that has sat for a while will crystallize but is still fine and good to eat and cook with so don’t throw it out! 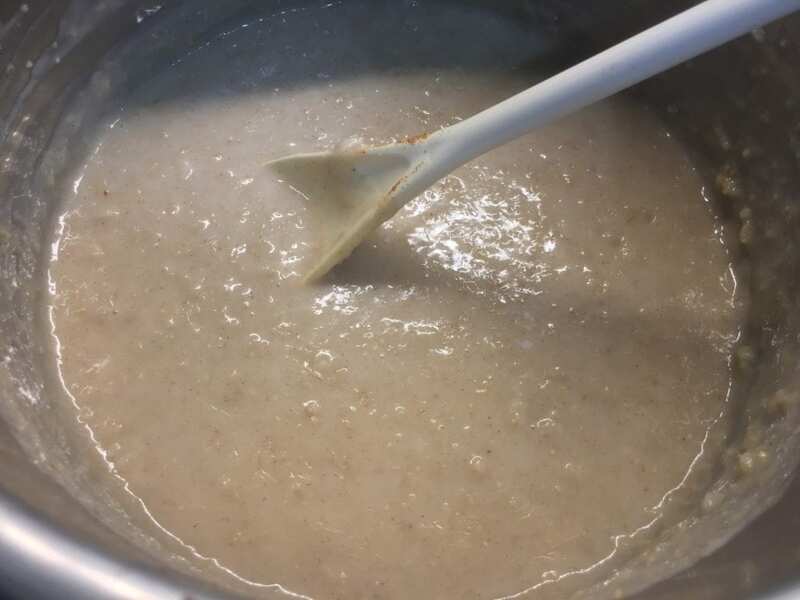 If you don’t want to use honey, you can always use organic maple syrup, Splenda, Stevia, granulated white sugar or powdered confectioners sugar to sweeten the oats. After you stir the honey and ground cinnamon into the oatmeal, add in one fourth of a cup of heavy whipping cream. Although it has more fat in it, I love using Heavy Whipping Cream in this recipe because it is just so creamy! If you don’t have heavy whipping cream, you can use any grade of milk including 0% fat free skim milk, and you can also use evaporated milk (fat free or whole fat) or any kind of nut milk. 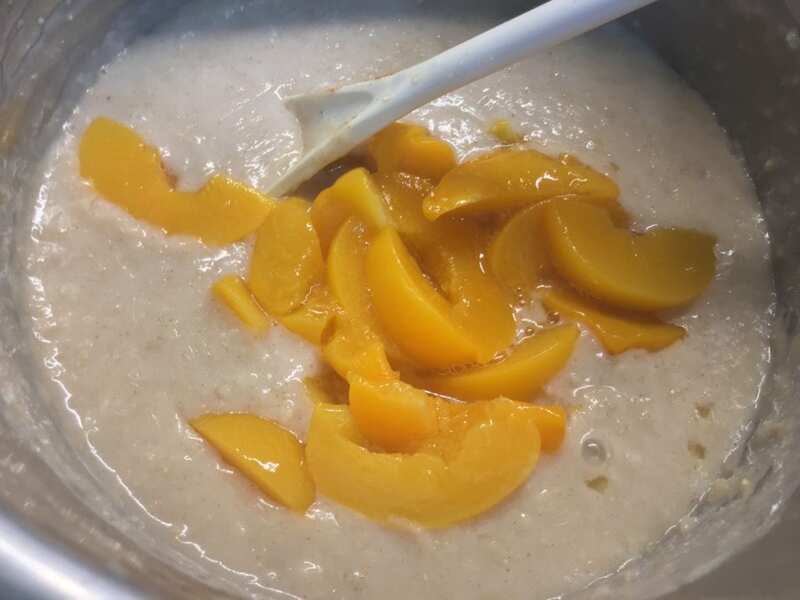 Stir the heavy whipping cream or the milk that you use into the oatmeal and get ready to add the peaches! 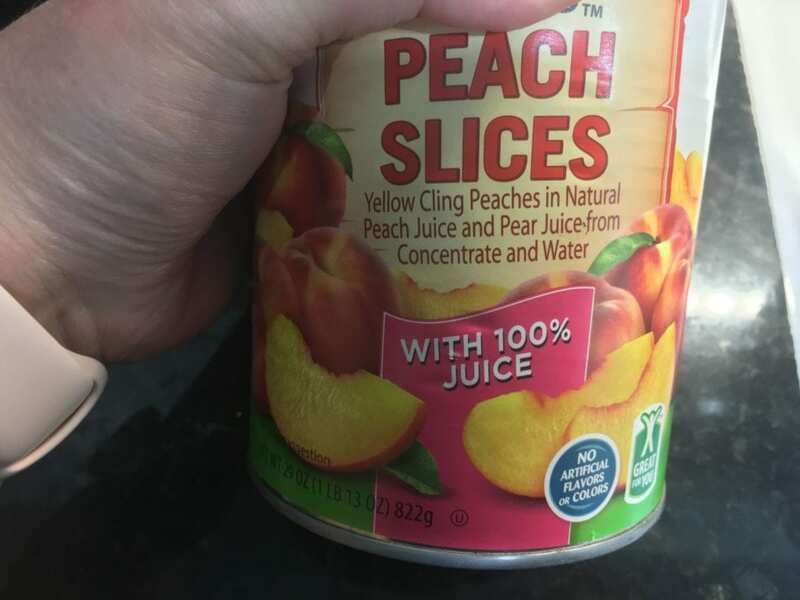 Open one, twenty nine ounce can of peach slices and drain it completely. It is also important to make sure your peaches have been stored in juice and not heavy syrup. Pour the drained peach slices into the instant pot with the oatmeal. Doesn’t that look so delicious and inviting?! This is one of our favorite breakfasts! 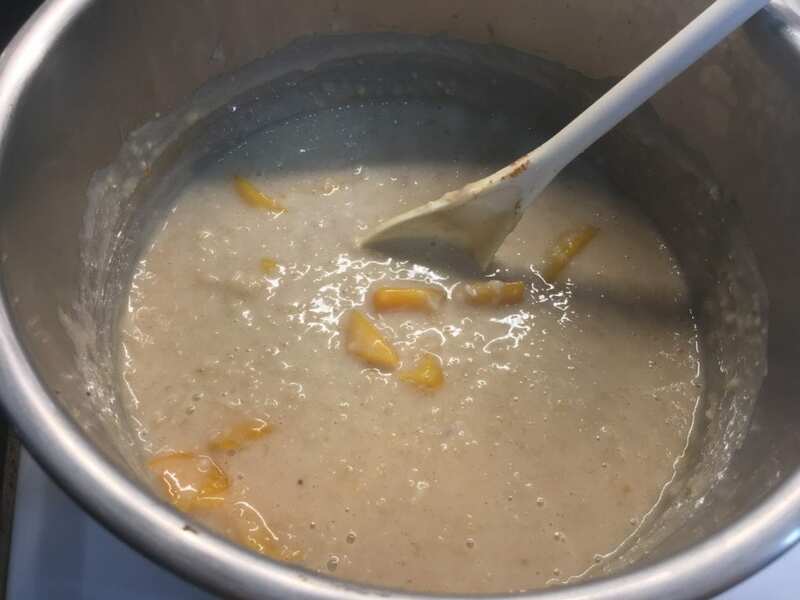 Stir the peach slices into the oatmeal and call the family into the kitchen! It’s time to grab some bowls, sit down, and enjoy a wonderful breakfast together! Breakfast is served! It’s hard to beat a breakfast that only takes eight minutes to get on the table. 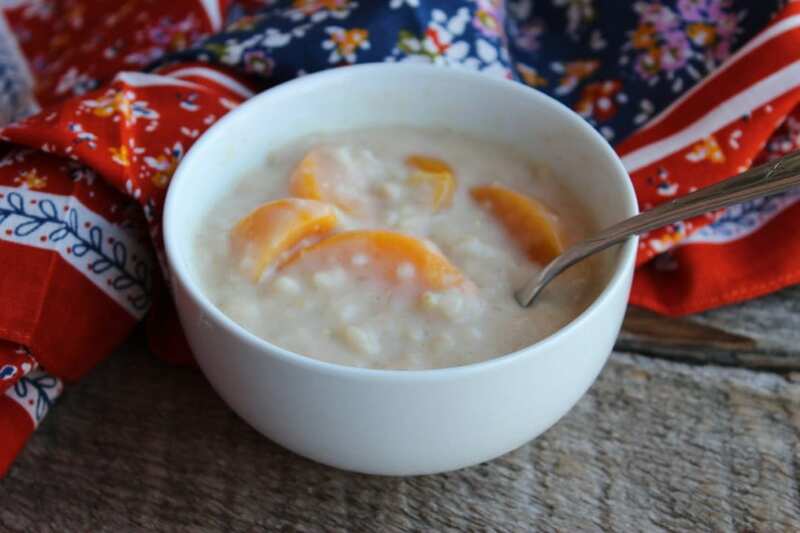 When that breakfast happens to be Peaches and Cream Oatmeal in the Instant Pot it’s just extra awesome and delicious! What is your favorite Easter morning breakfast? 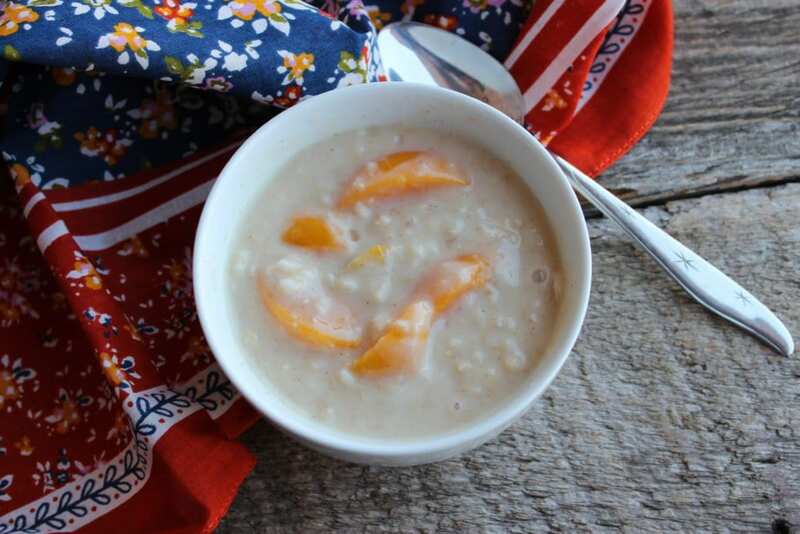 I think these simple and delicious Instant Pot Peach Oats will definitely be on our table for breakfast this Easter! Happy breakfasting my friends – and Happy Easter! A tasty, fast and easy oatmeal, perfect for a cool spring morning! 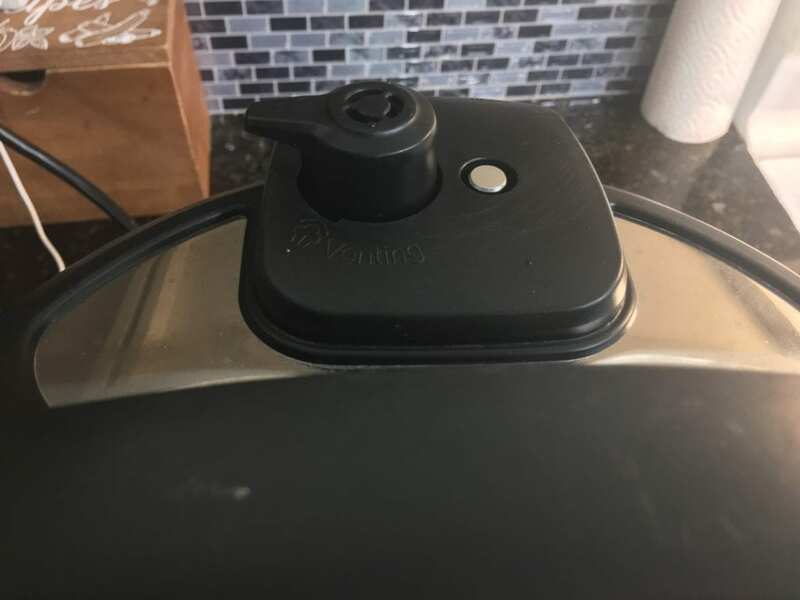 Place oats and water into an Instant Pot electric pressure cooker and lock the lid on, placing the steam release valve in the sealing position. 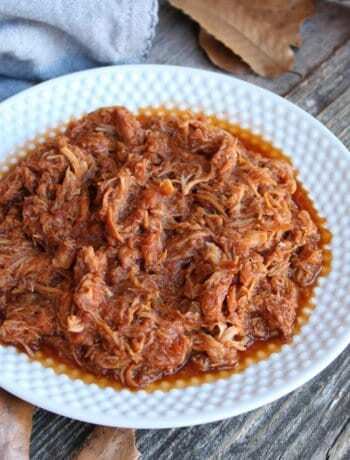 Select "manual" "high pressure" for "3 minutes" and then let your Instant Pot do the work. Once the cooking time is complete, carefully quick release the steam and then remove the lid. Stir the oats and then add all other ingredients, stirring well. 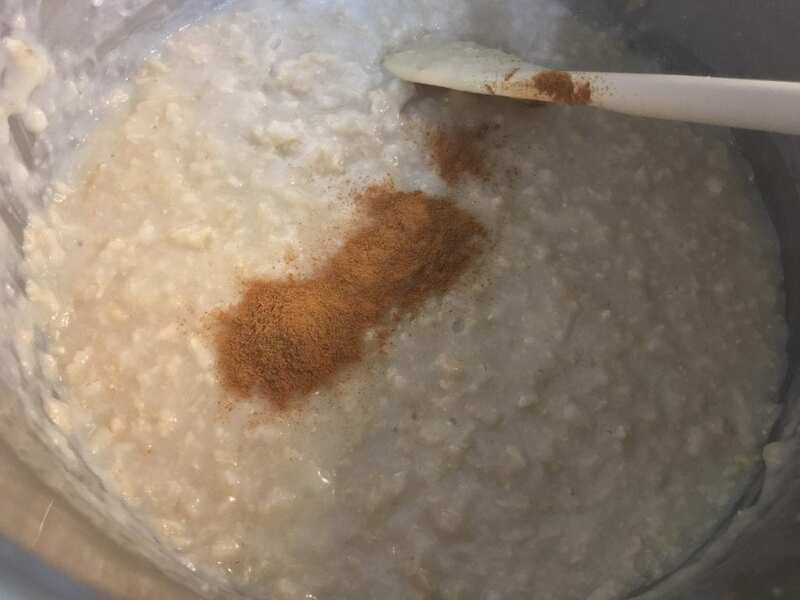 A FEW NOTES: I like to use honey to sweeten my oatmeal but a variety of things can be used, including Organic Maple Syrup, Stevia, Splenda, and granulated white sugar. Any milk or cream can be used. I like to use Heavy Whipping Cream but you can also use Half of Half Cream, Evaporated Milk (nonfat or full fat) any grade of milk including 0%, or any type of nut milk. Looks quite tasty!! Thanks for sharing at the What’s for Dinner party – and have a wonderful week. Hope we see you next Sunday too!